The island of Capri is the island of dreams, situated in the Gulf of Naples, south of the city of Naples and opposite the Sorrento peninsula. It is a must see destination in any itinerary for those visiting Sorrento, Naples and the Amalfi coast. As a matter of fact, not surprisingly, it is one of the most popular and most famous destinations in the world. We will help you to make the most of your trip. The island of Capri in Italy is a mix of natural beauty and culture, the main attractions are gifted by the island itself, like the astonishing Faraglioni (symbol of Capri) and the famous Blue grotto. Its beauty has been appreciated since Roman times, and still today, you can admire the ruins of their ancient imperial villas. Day trips from Sorrento to Capri are the highlight of the majority of travelers holidays. Besides the helicopter, the only way to reach the island of Capri is by sea and there are two possibilities, the first a shared or private boat tour (which includes a complete or half day tour of the island) or the local hydrofoil. If you are undecided to get the boat or the ferry to go to Capri from Sorrento, this decision has to be based on how you want to spend your day on the island and what you want to visit. Let’s view these two options together to understand which is the right choice for you. Shared tour or private tour? 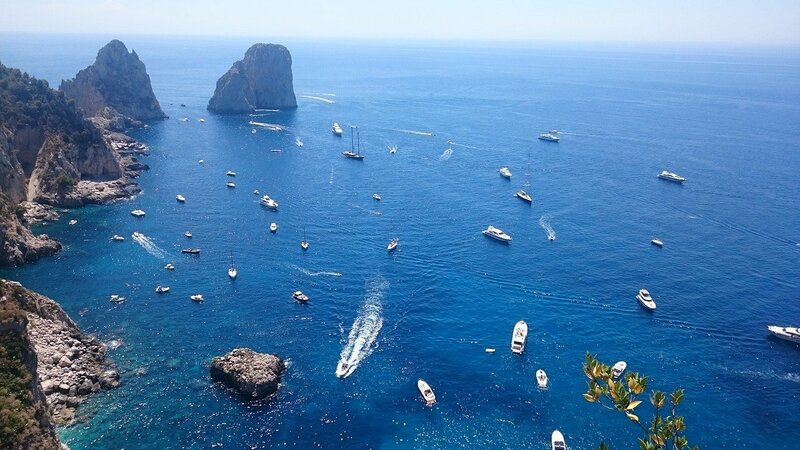 Here’s a view of Marina Piccola in Capri. 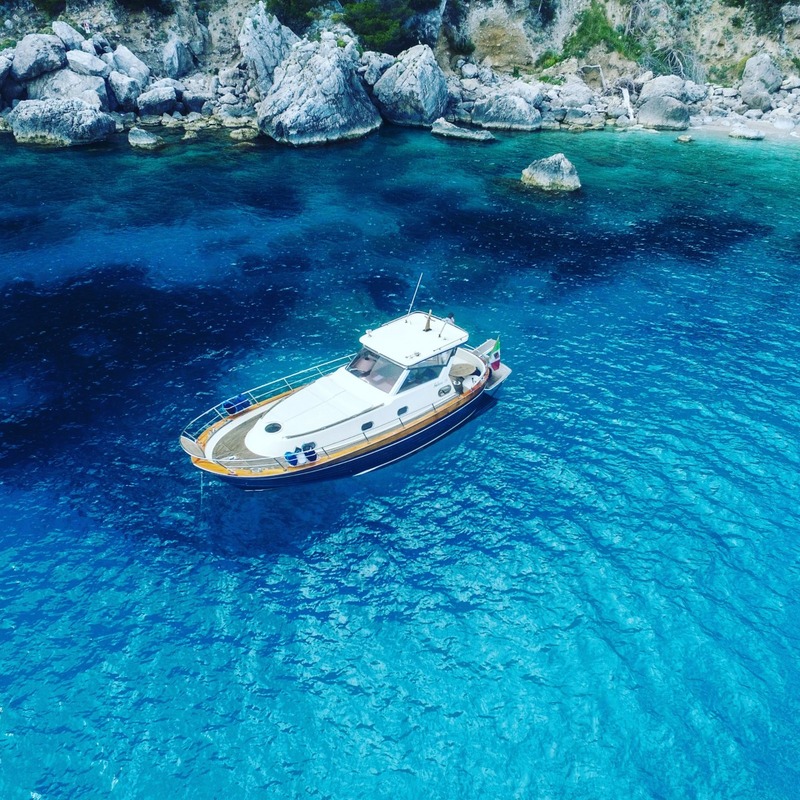 Visiting Capri by boat, as we always recommend to our guests, is probably the best choice if you love travelling by sea and if you plan to visit the Blue and or the other Grottos of Capri. It is precisely the Blue, White and the Green Grotto, the Faraglioni, Marina Piccola bay and all the other places that can only be visited by sea, that persuade most visitors to book a boat via Capri daily tours from Sorrento. Actually, unlike the ferry that, departing from the port of Sorrento leaves you simply in the port of Capri, the daily boat tour from Sorrento allows you to explore, experience and enjoy the island, circumnavigating the coast on a traditional Sorrento Gozzo boat, exploring the Blue and White Grotto (weather permitting), giving the possibility to stop for a swim and to spend a pleasant day at sea is a unique and fun experience. Boat tours from Sorrento to Capri are scheduled every day from March until November and the average price for an adult is €90. visit the Blue Grotto and the Faraglioni, the Capri caves and the Marina Piccola bay without taking another boat from Capri. experience more than just the journey. spend a day on a boat that offers all facilties, from a toilet to a kitchen, from a shower to an outdoor lounge. spend a day in complete relaxation without any stress. not having to organize the trip based on the times of the public ferry. not having to worry about how to reach the port as the tour includes pick-up from your accommodation. Our guests from #newzeland and #uk @joy_hans and @elburgess know how to have fun in #capri ~ ~ ~ 🎉🇮🇹 Write us for more info about MUST SEE SIGHTS and ITINERARIES! Well, the answer is simple, deciding, depends first on your budget, the number of people travelling and the flexibility to change the itinerary of the day. The private tour is less economic than the shared, with the shared tour a maximum of ten to twelve people are allowed on board at one time. You may want to consider the shared tour if you are a group of this amount of people, which in the end consequently turns into a private tour. Secondly, although there is a slight flexibility with the shared tour, the private tour allows guests to manage their day completely, you can add and change your plans, stop at the beaches you want to visit, the destinations, the time you want to spend in one place compared to another and so much more. As for shared tours, some of Sorrento’s most professional skippers have organized tours that allow you to experience the best of Capri and the coast in a single day, guaranteeing guests an unforgettable experience. Departure at 9.30 from Sorrento towards Capri. This first part of the tour includes visiting the most beautiful beaches on the coastline of the Sorrento peninsula such as the Bagni della Regina Giovanna, the Marciano waterfalls and Punta Campanella. The arrival in Capri is around 10.30 am. From this moment on, we advise you to have your camera handy as it is now that the real tour begins. A complete tour of the island to discover the Faraglioni Rocks, the White, Green and Blue Grotto, the Punta Carena lighthouse, Tiberio’s jump and Villa Malaparte. You can admire the stunning and inimitable lights effects of the rocks. After the tour of the island, you will dock at Marina Piccola where you can enjoy lunch (packed lunch included in the price) overlooking the sea. After lunch you will have about three hours to visit the island of Capri by land. Here are our tips: Capri, the complete guide. Once back on the boat you can stop for a swim and take the opportunity to go snorkelling with the equipment provided by the skipper in the crystal clear water of the Bay of Marina Piccola. The tour will end with a relaxing sail back, sipping a glass of prosecco on the bow of the boat and admiring the beauty of Capri and the entire Sorrento coast that slowly passes by. The return is scheduled around 5.30 pm with a transfer back to your accommodation. Some things are well worth the extra euros and this is one of them – it is such a treat to have a boat tour around the island, admiring the beautiful coast, the grottos and jumping in and swimming in the crystal clear waters are an unforgettable experience. Capri is a unique place and to see the whole island from the sea is…. well….unforgettable. 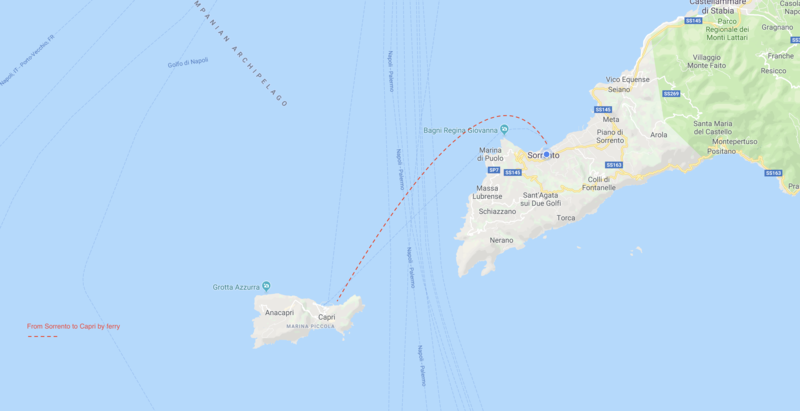 Here’s a map to better understand how to get from Sorrento to Capri island by ferry. For those wishing to visit the island of Capri mainly by land, without visiting the Blue Grotto or the Capri coast, we recommend taking the ferry departing from Sorrento. The reason is simplicity. The ferries are comfortable, fast and practical and in less than thirty minutes you reach the island of Capri. If you want to visit the Blue Grotto, you can buy a ticket, where you take another boat ride that leaves from Capri Port of Marina Grande and takes you to the Blue Grotto. Ferries depart from the port of Sorrento approximately every hour with various maritime companies. Among the most important are Alilauro and Caremar. Getting from Sorrento to Capri by ferry takes about 20/30 minutes. The ticket price varies from €18.00 to €22.50 per person, one way, the price of the ticket depends on the company you choose but they can be purchased online. As a local, I advise to buy the ferry tickets personally at the box office at the port before departure in order to clarify the weather conditions and then buy the return ticket in the port of Capri at the most suitable time you wish to leave. You can bring luggage, strollers, animals and bicycles by paying a small extra fee ranging from €2.10 to €6.30. One of the most frequent asked questions from our guests is, should I book the ticket in advance? It is always advisable to buy the ticket around 25 minutes before so you have the time for boarding and to be sure that there are no delays or cancellations for the trip.